Singing Words, the incredibly rich sequel to Singing Sounds, turns the important and complicated task of learning to talk into something as sweet as a song. In all her inventive lyrics, Bollinger makes ample use of the common, everyday words-zoo, beach, car, store, sky, grass, pizza, blue, green, ice cream-children learn first. Then she miraculously splices in a good bit of reasoning so each song meets and stretches children at a variety of developmental stages. And that means everyone sings this great children’s music! Well aware of what children learn when, and how, Bollinger sneaks little lessons into a melodic and instrumentally diverse framework. In Singing Words, she introduces children to pronouns (“Where could my little bear be? Where is she?”), question words (“Who delivers the mail? The faithful mailman.” “What color is the sky? Blue!” “When do you put on your coat? When it’s time to go outside.”), prepositions (“First I put my toe in; Then I push my heel down.”) and helps them practice sequencing (“How do you get in bed? First I pull the covers down; Then I tuck my toe in.”). She also emphasizes difficult sounds and uses a call-answer approach that keeps everyone listening and singing back with accomplished answers. In her unique, hallmark style, Bollinger has created music as complex as the magic. She uses African log drums, kazoos, a muted trumpet, a piano and the Hullabahoos-the men’s acappella group from the University of Virginia. 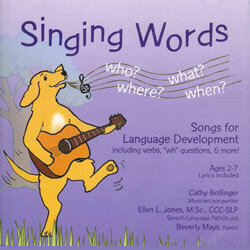 Singing Words not only gets everyone singing and having fun, it sharpens minds. Lyrics included.